"The Prehistory of the Lower Missouri River"
St. Louis has been a cultural hub going back 12,000 years, since the last ice age. Being at the Confluence of the continent's two longest rivers, it has always been a site of pilgramage, trade and a diversity of cultures. Joe Harl and his collegues at the St. Louis Archeological Research Center have been involved in many recent archeological digs revealing this rich heritage here. He will be sharing his knowledge of the parade of cultures in this area, from the first hunting bands, through the widespread Woodland culture, the complex civilization of the Mississippians based out of Cahokia and the later groups moving through as Europeans moved into the area. There is no one in the area that knows quite as much as Joe Harl about the latest discoveries of our heritage in the Confluence area. Mr. Harl graduated from Washington University in St. Louis with an MA degree in Anthropology. 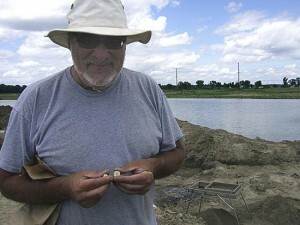 He has been performing archaeological investigations across Missouri and Illinois since 1978 with the University of Missouri-St. Louis, and has served on the board of directors for the Missouri Archaeological Society and the Missouri Association of Professional Archaeologists. is hosted by Missouri River Relief, Friends of Big Muddy, Greenway Network, the Big Muddy National Fish & Wildlife Refuge and the Columbia Fish & Wildlife Conservation Office (USFWS) with the following list of partners. All speakers are presenting for free. Thank you for sharing your knowledge with all of us! This is the first in a series of St. Charles presentations. Help us make it grow! A special thank you to Greg Poleski of Greenway Network for making this happen! "Chesterfield turns over 900 artifacts to museum" - Sept. 26, 2011 Suburban Journals article about Dampier site, a Mississippian market area in the Chesterfield bottoms that Harl refers to as the "original Chesterfield Mall". "Valley Rich in More than Soil" - May 7, 2009 Suburban Journal article on Dampier site, a Mississippian market area in the Chesterfield bottoms.